As an ASP.NET developer you are already familiar with server controls and HTML helpers. What do they do? Simply put they execute some server side logic and generate HTML markup. The HTML markup thus generated is then rendered in the browser. In ASP.NET core you can continue to use HTML helpers as in ASP.NET MVC. However, there is a better alternative - Tag Helpers. Tag helpers are better than HTML helpers because they are markup friendly. They seem more natural to go along standard HTML markup. What's more is you can easily build your own custom tag helpers. The remainder of this article will illustrate how. Here, the latestblogpost tag helper presents itself as an independent markup element. It has two attributes namely Category and Count. The Category attribute indicates the blog post category or tag to be used (AspNetCore in this case) to pick the latest posts. The Count attribute indicates that 10 items are to be displayed in the latest posts list. Notice the above code carefully. The LatestblogpostsTagHelper class inherits from TagHelper class (Microsoft.AspNetCore.Razor.TagHelpers namespace). 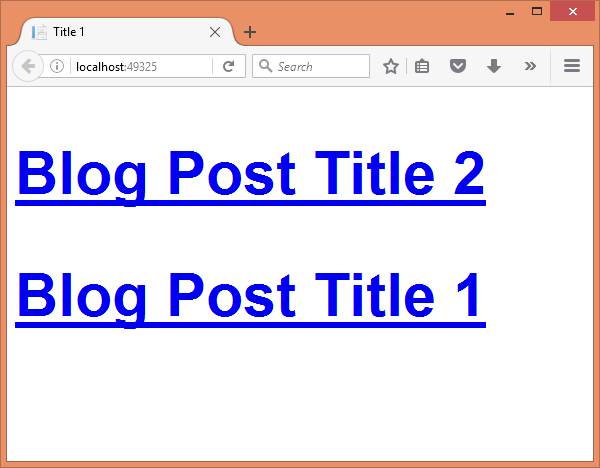 The LatestblogpostsTagHelper class consists of two properties - Category and Count - and an overridden Process() method. The Category and Count properties correspond to the respective attributes used in the tag helper markup earlier. The Process() method is where the processing logic of the custom tag helper resides. The Process() method receives TagHelperOutput parameter that is used to render the desired output. The TagName property indicates the HTML tag name of the resultant markup (div in this case). The Attributes collection is used to set the class attribute of the <div> to latestBlogPosts. Then an Entity Framework Core code connects with the database and fetches records from the BlogPosts table. The BlogDbContext and BlogPost are discussed later. Notice how the LINQ to Entities query makes use of the Category and Count properties while retrieving the records. A foreach loop then iterates through the latest blog posts and generates a list of hyperlinks for each post. This is done using a StringBuilder. Finally, SetHtmlContent() method is used to render the HTML fragment. Of course, you can also create the database manually instead of using these commands. In order to use the latestblogposts tag helper successfully on a razor view, it must be made available to the view. You do this using the @addtagHelper directive. You can place this directive either inside the view file itself or better yet inside _ViewImports.cshtml file. After creating the database and adding a few dummy records run the application. The following figure shows a sample run of the application. The same rule applies for attribute names also. Thus article-category attribute would be mapped with ArticleCategory attribute and article-count attribute will correspond to ArticleCount attribute. As you can see the LatestblogpostsTagHelper class is decorated with [HtmlTargetElement] attribute that maps it to the latestblogposts element. Similarly, Category and Count properties are decorated with [HtmlAttributeName] attribute. The [HtmlAttributeName] attribute maps the underlying properties to Category and Count attributes respectively. In this case the custom tag helper takes a form of <div> element. The <div> element has two attributes article-category and article-count. 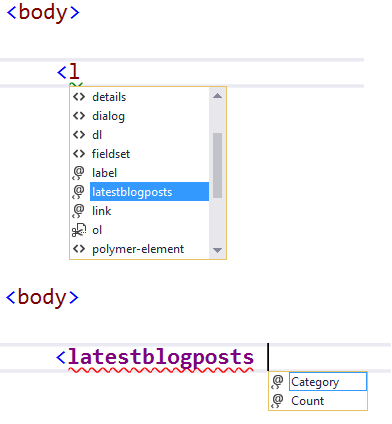 Notice that the LatestBlogPostsTagHelper class is now decorated with [HtmlTargetElement] attribute. The target element is set to div. Now, there could be many <div> elements on the page. We wish to invoke our helper only for a <div> that has article-category and article-count attributes (you could have used any other attribute names). The second parameter sets the Attributes filter to article-*. This way only the <div> elements having attributes of the form article-* are processed by this helper.